Frostpunk is not a PlayStation 4 game, at least not yet. I didn’t know this when I sat down to demo the heart wrenching city builder by the developer behind This War of Mine. I watched the whole presentation from lead designer Jakub Stokalski with rapt attention, wanting to delve further into the dark core of the hard decisions that need to be made. When it was all over I could only rattle out a single question with an answer that was becoming increasingly clear: Will Frostpunk be coming to PS4? There are no plans beyond the PC release at this time. This was the response I was given, or some variation of it anyway. Stokalski let me know that while the focus was currently on PC, they weren’t against looking into a console release at some point. Sure, I’ve heard that before. Sometimes it happens, and sometimes it doesn’t. There are a variety of factors involved in a decision like this one, and I’m not deluding myself into thinking my crusade to bring the game to PS4 will be the call to arms that they need, but maybe, just maybe, it could show that there is enough interest from the console community to warrant looking into. There aren’t any gameplay videos out there that I can find for Frostpunk. E3 was the gameplay reveal, so I’ve currently got the exclusive kicking around in my head. I can’t show it to you, but trust me when I say that Frostpunk is awesome. 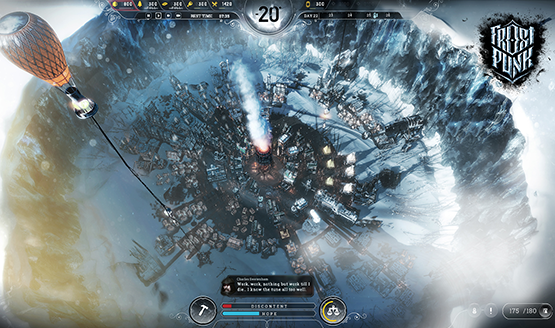 Set in a world besieged by cold, and based on a time about 150 years ago, Frostpunk sees you managing the final city of survivors in an icy crater. In order to survive the frozen apocalypse, you’ll have to put these survivors to work and begin to build a bastion of hope for humanity. Everything you construct revolves around a central heat source, building out in a circular pattern rather than a traditional grid. It’s a design that highlights the importance of that generator to your town’s well being. Frostpunk isn’t just about building enough shelters for everyone to have a warm place to sleep though. Difficult decisions will need to be made in the interest of managing this town. Are you short on laborers? Maybe you’ll need to institute a child labor rule to put children to work. Rations not quite cutting it? You can opt to add sawdust to the gruel to make it go further. These are the light, early decisions. Later in the game you’ll start getting into how to care for the critically wounded and even allowing for cannibalism to help round out meal time. Console gamers may be familiar with 11 bit studios’ previous work This War of Mine, or more specifically the console version This War of Mine: The Little Ones. It was a PlayStation Plus title recently, so if you haven’t played it, you may have access to check out one of the most bleak indie games. The impossible decisions not only made the game hard, but really stabbed a knife into your heart as you realized that managing a shelter full of four or five people in war time asks you to do egregious things, often resulting in at least a few deaths and the sad horrific stories of anyone who might actually survive. 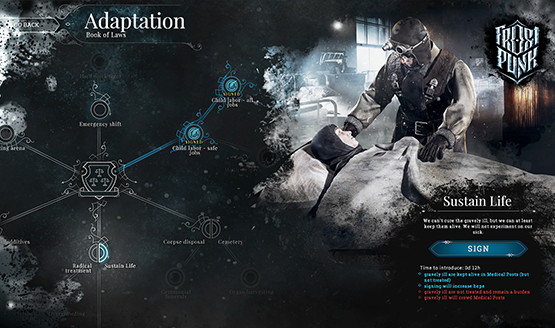 Where This War of Mine focused on individual stories, Frostpunk becomes about society and the things you might read in a history book about communities pushed to the very edge, forced to take actions that we may find appalling, just to survive. In fact, the studio has been doing deep research into things that actually happened throughout history. That sawdust bit I mentioned actually happened in gulags. Cannibalism happened quite often in groups of settlers moving out west. Child labor has been a problem in many places and still is since basically forever. I can’t imagine the dark places this team has had to travel in order to find the perfect difficult choices that create a deep internal conflict, struggling to both maintain the light and hope of your town while making sure that there is still a tomorrow. Oft times it is an untenable balance. Why Ask for a PS4 Release? That’s a great question, and I’m glad you asked. Aside from just wanting great games on PS4, and Frostpunk looking like something special, the PS4 doesn’t currently have a lot of city builders. It’s true, the genre works far better with mouse and keyboard than it does a controller, but there are a few city builders out for consoles, so it’s not entirely impossible to tune for face buttons and analog sticks. In fact, the circular layout of the build grid is just asking to be applied to analog stick controls, with the book of laws and other parts of the UI controlled via the d-pad, face, and shoulder buttons. Maybe they can even work the touchpad in. Again, maybe there are a variety of factors holding back a Frostpunk PS4 release, but I want to make sure that fan support isn’t one of them. Frostpunk isn’t currently coming to PS4, but I want it to, and I want you to want it to. Help me out by making sure 11 bit studios knows that not only do we want more city builders on the console, but that we want more meaningful games that stick with us even after we turn the console off. 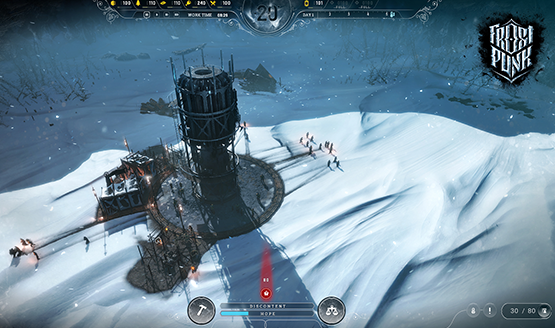 To contact 11 bit studios and the Frostpunk development team about wanting a PS4 version, reach out to them at these links.